Foam Board, is a common name of plastic or rubber foam material. There are various plastic or rubber that can be made into foam material. For instance the PE foam, EVA foam, PU foam or EPDM foam. EVA foam is durable plastic foam material made of EVA (Ethylene Vinyl Acetate) and PE (Polyethylene) resin. It is soft, durable, water proof and non-toxic. Original EVA foam material are mainly produced in two forms: blocks and tubes. Suppliers of EVA foam blocks usually slice the blocks into custom thicknesses called EVA foam sheets. Traditional EVA foam material is mainly used for shoe insoles, sport goods, mats for karate, taekwondo, yoga, martial art exercises, and machinery cushion. 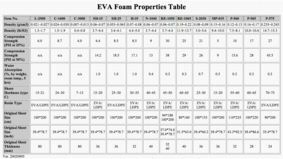 With highly improved manufacturing process and new chemical formula, higher grade of EVA foam materials comply with EN 71 and ASTM F963 safety standards are available. Most of these new materials are used for toys, educational and handicraft items.